Hello everyone! 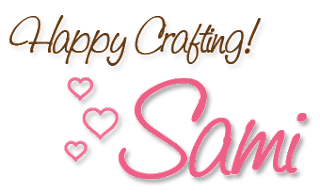 Samantha here bringing you another Tuesday Tips and Tricks segment. Today's topic is something I am REALLY excited about (as you will see in a moment)! I would like to talk to you about some of the wonderful things you can fill Ranger's Mini Misters with! Well, these little babies were the the first thing I ordered from the new Ranger items available now at the iCopic store!! The first thing I did was put some dye refill ink into a Mini Mister. 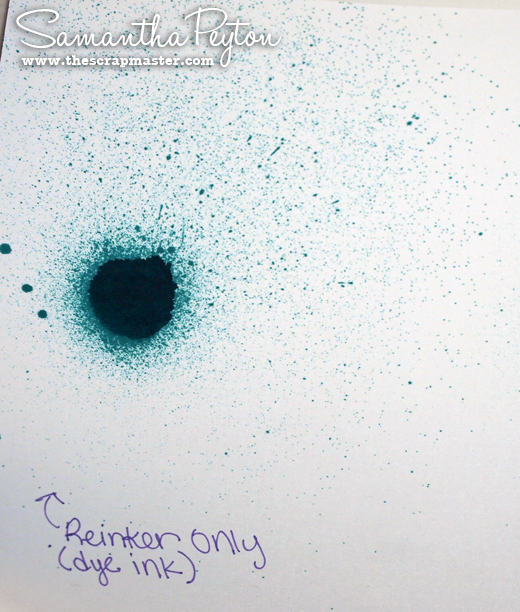 You can use any type of dye ink out there including the Tsukineko ink refills and the Ranger Distress refills. 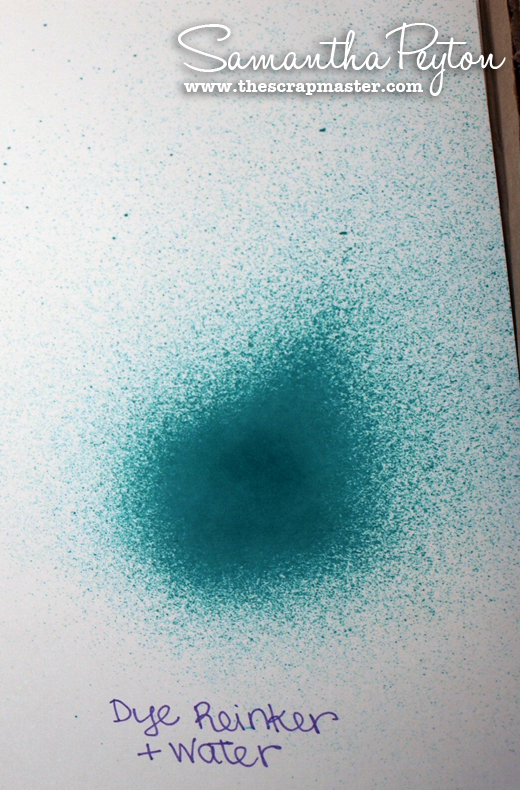 As you can see below, when I filled the Mini Mister with refill ink only (no water), it produced a very splotchy effect. Next, I diluted the dye ink with water and the effect was much softer and less blotchy. Next, I wanted to see if I could get a glittery effect! 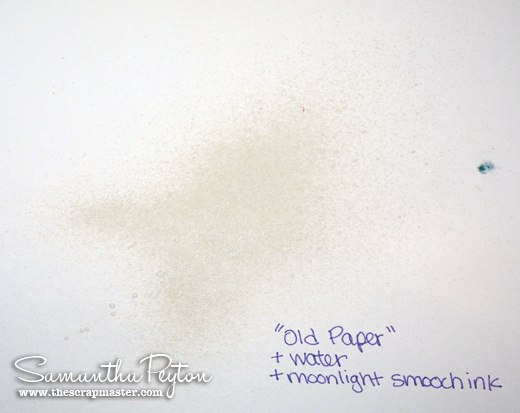 So I looked around my craft area and found some Smooch Pearlized Accent Ink in the color "moonlight" (white). I didn't have any super fine glitter to try out so I used this accent ink. 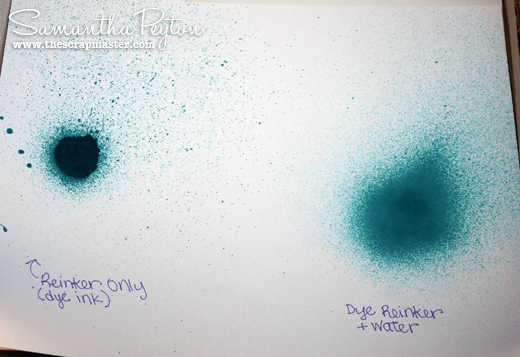 For the samples below, I filled the Mini Mister with dye ink, Smooch ink, and water. 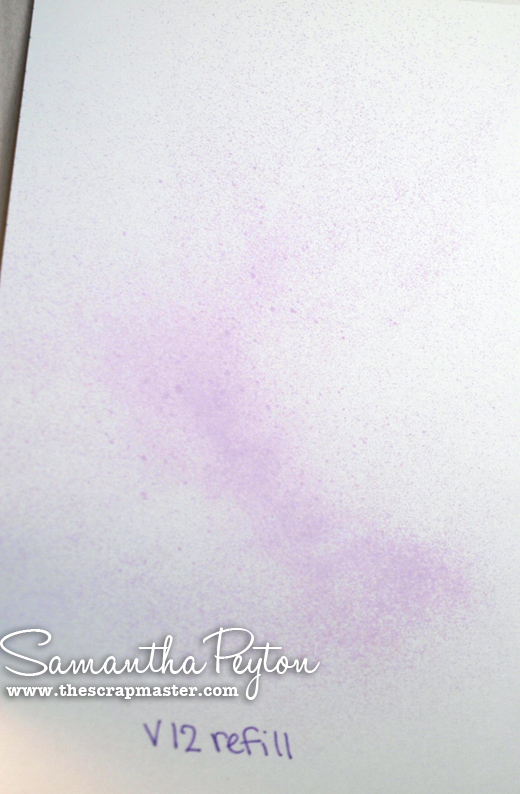 The pearlized accent ink added a really nice soft shimmer to the ink. Next I played around with the Distress Ink refills. 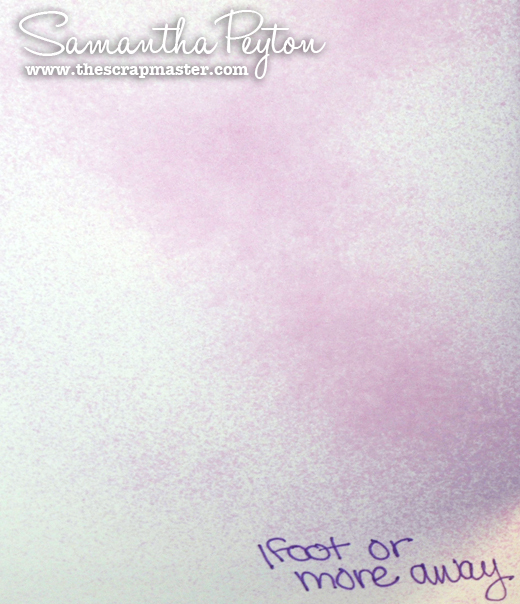 Here I used a few drops of Ranger Distress ink in the color "Old Paper" combined with water and again the Smooch Accent Ink for some shimmer. 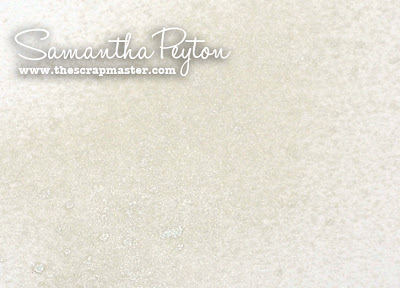 I really love the way this color turned out because I can see this Old Paper color being used to make anything look a little softer and softly worn looking. 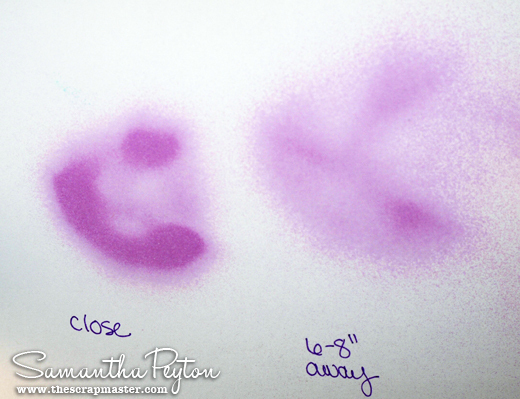 Next, I wanted to see what happened to Distress ink when misted with water. I filled a Mini Mister with water only for this experiment. 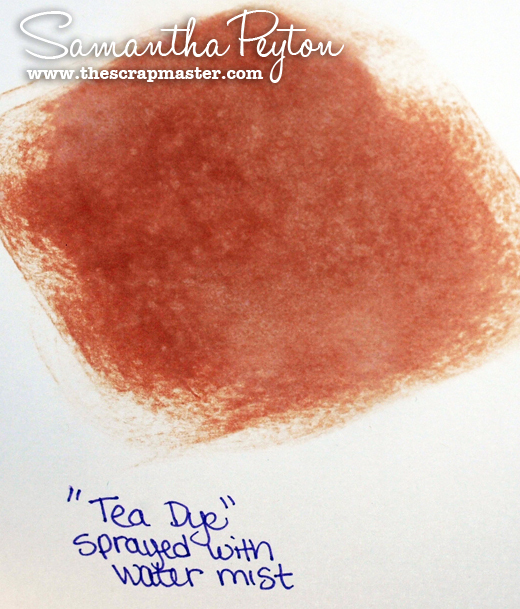 Here I used the Ranger Ink Pad in the "Tea Dye" color and rubbed it directly on my paper (this could be use for distressing your paper, coloring the edges of the paper, inking the raised parts of crinkled paper or an embossed paper, etc). 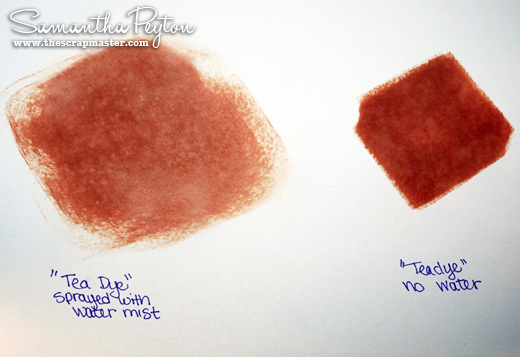 Below, you can see the difference between the Tea Dye ink misted with water versus the plain Tea Dye Ink with no water sprayed onto it. 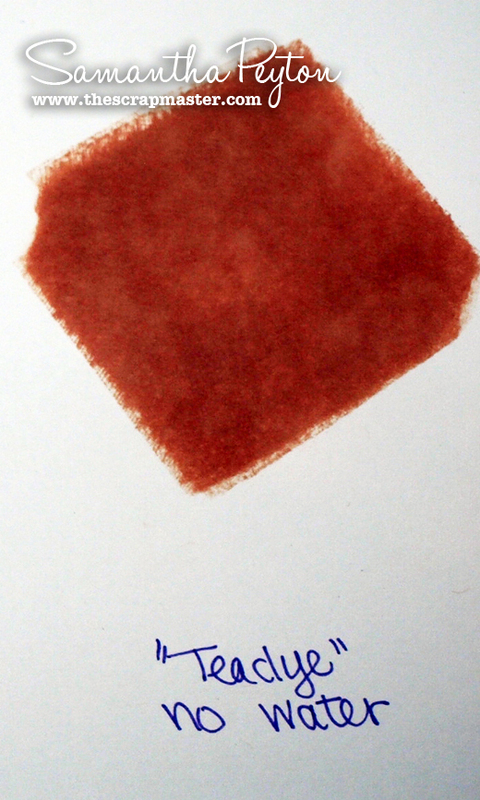 As you can see, the misted ink becomes softer and lighter looking. You can see a lot of variation, almost like a faux suede effect. Next, I wanted to see if I could create a faux watercolor technique that I have heard about before. 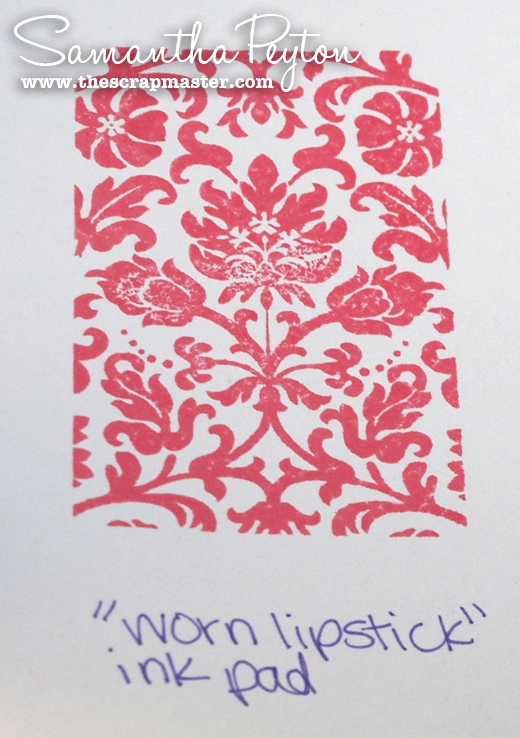 What I did here was I inked up the stamp with the "Worn Lipstick" Distress Ink Pad. 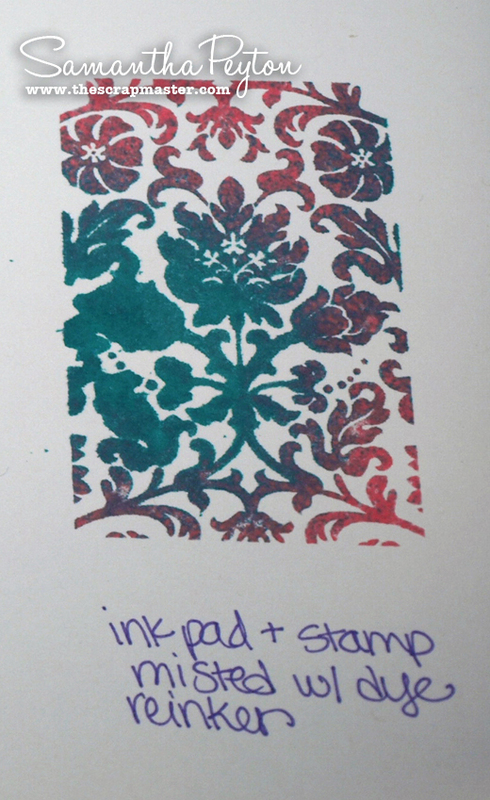 After the stamp was inked, I stamped it like I normally would onto the paper (that is shown on the left). Next, I reinked the stamp with the same ink and then misted it with water before stamping on the paper (that is shown in the center). 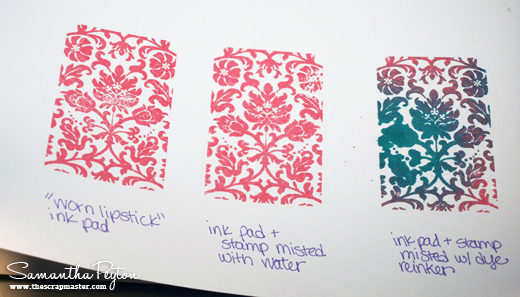 With the image on the right, I inked up the stamp with the "Worn Lipstick" color and then misted the stamp with a Mini Mister filled with the dye ink +water shown in the very first example. 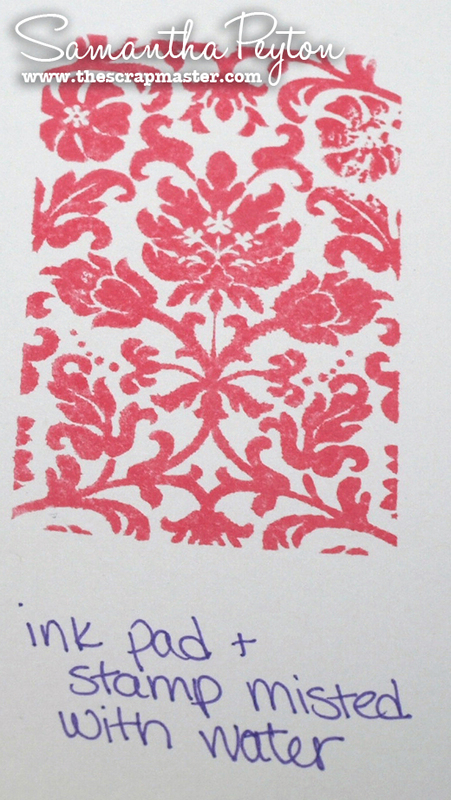 Here is the image that was produced when the stamp was misted with water before stamping. This created a faux watercolor technique and you can tell that the edges aren't as crisp as the image above. 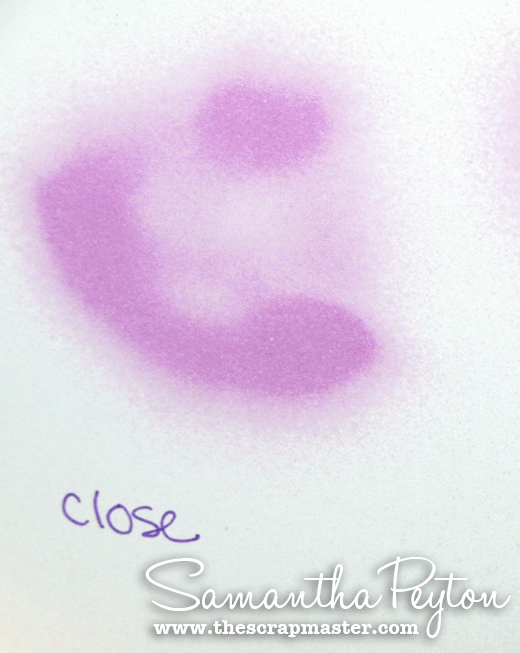 This next image was sprayed with a different color ink after the stamp had been inked with the "Worn Lipstick" color. TIP: Make sure not to spray too much ink! I noticed that I had sprayed too much ink onto this one. 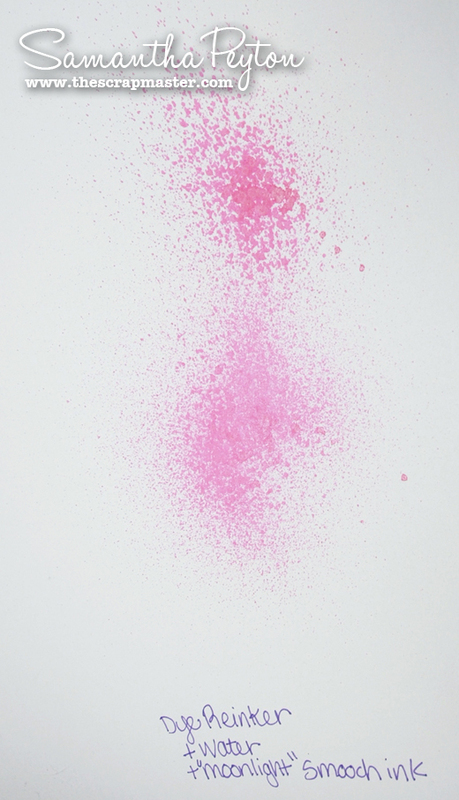 If you spray too much, you could probably remove some of the ink with a paper towel. The next thing I tried was filling a Mini Mister with a Copic refill ink, here I used V12. When I sprayed using the Copic refill, I really loved the look of it! The ink is much less viscous than the water mixtures had been and it sprayed pretty evenly over the paper. 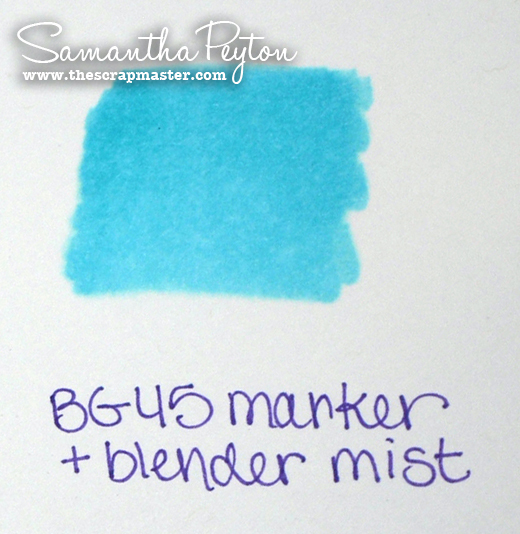 For my next experiment, I filled a Mini Mister with Colorless Blender #0 refill ink. I colored a solid area using BG45 and then sprayed it with the Colorless Blender Ink. The result was a very mottled and blotchy effect. This would be a great technique to use to add a little texture to an image you colored. I wanted to show you how distance is key to spraying with Mini Misters. 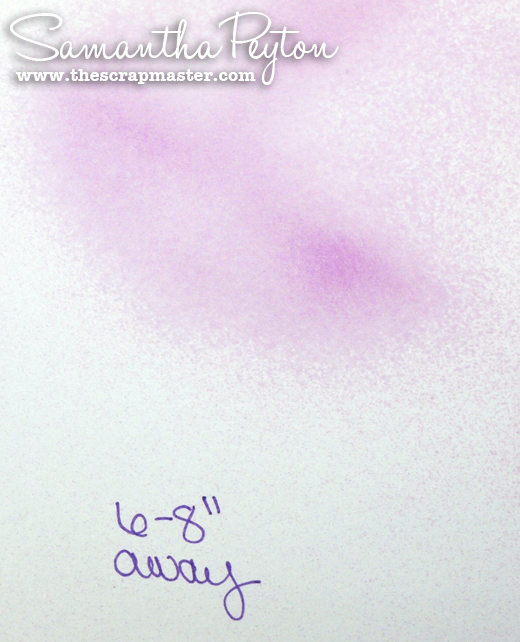 For the first example below, I sprayed really close to the paper, maybe an inch or two away from the paper. 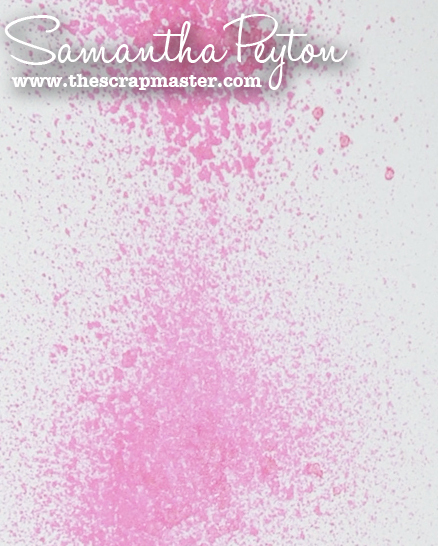 Here you can see what it looks like when sprayed approximately 6-8inches from the surface of the paper. And here you can see what it looks like when I sprayed approximately 12-14inches from the paper. Whew! Did you make it through all of those photos ok? I am guessing your brain is just buzzing with ideas on what YOU could do with the Mini Misters. I hope that you gathered some ideas that you will use. If you have other techniques or ideas on how to use the Mini Misters, please leave us a comment! I would love to hear more ideas. 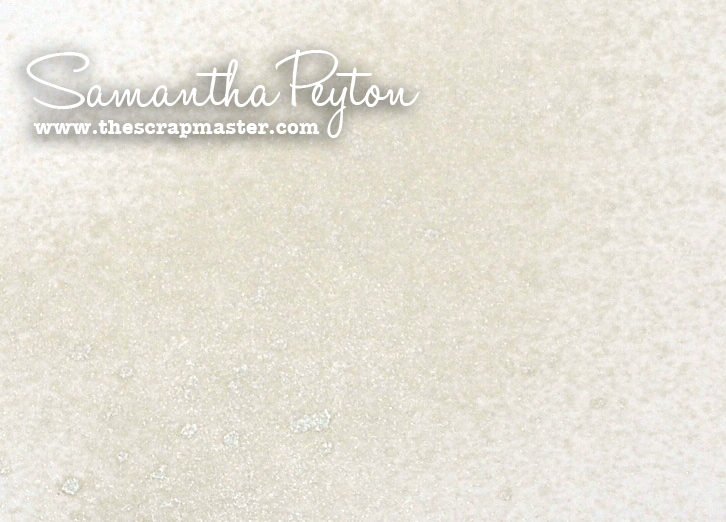 Tomorrow Dana will be back with another one of her gorgeous projects for you. Amazing shots and info Sami! I love my Mini Misters! They definitely give the finest spray of anything I've tried! I love your stamp with the two colors! Thank you for posting this--it's great to have a reference!